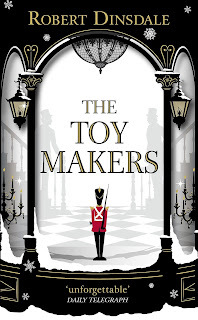 I was immediately drawn to the striking cover of The Toymakers and decided to read this on the run up to Christmas to inject a little magic into my life. I didn't expect to feel so emotional at the end but the power of Robert Dinsdale's writing clearly worked its way into my heart like a toy soldier scaling a battlement. 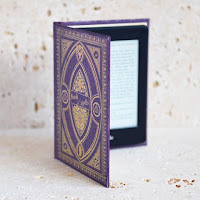 Don't be mistaken: this is not solely a magical feel-good story, it is mainly set during World War I so be prepared for loss and devastation but you can forget about it for a while when you enter Papa Jack's Emporium. The Emporium is hidden away down a side street in London and you could easily walk past it, if you didn't know it was there. This magical toy shop opens at first frost and closes as the first snowdrop flowers but in the short time it is open you can find every toy imaginable in its four walls, but even more toys that you could never have imagined. Papa Jack and his sons, Kaspar and Emil, create all the toys themselves and there's quite a rivalry between the boys as to whose toys are the best. Cathy Wray is drawn to the Emporium after she sees an advert in the newspaper, just when she thought she could not escape her predicament. So she runs away from home and starts a job in the Emporium, but when the first snowdrop flowers she has nowhere to go and hides in the wendy house in the Emporium. Both brothers find her at different times and keep it a secret from each other as their rivalry extends to who will win Cathy's heart. After the war, this intense rivalry threatens to be the downfall of the Emporium when Kaspar meddles with Emil's precious toy soldiers...the toy soldiers don't want to fight anymore and seem to have minds of their own. Can the Emporium ever survive when Kaspar, Emil and thousands of toy soldiers are at loggerheads and Hitler's bombs are flying overhead? Let your imagination run wild and expect the unexpected in The Toymakers. My imagination went into overdrive and I thought of those horrific Chucky movies as the toy soldiers were scuttling about all over the place. I found it terribly heartbreaking as the horrors of the First World War were touched on and hoped the soldiers had somebody like Kaspar in the trenches with them to give them some comfort. The Toymakers wasn't quite what I was expecting, but I enjoyed it nonetheless. The Emporium is painted in such glorious colour through the magical prose that I felt as if I was visiting it myself. I think The Toymakers is a little like the Emporium itself, it's only going to be enjoyable to those who believe in magic but know that the big bad world is right outside the door.